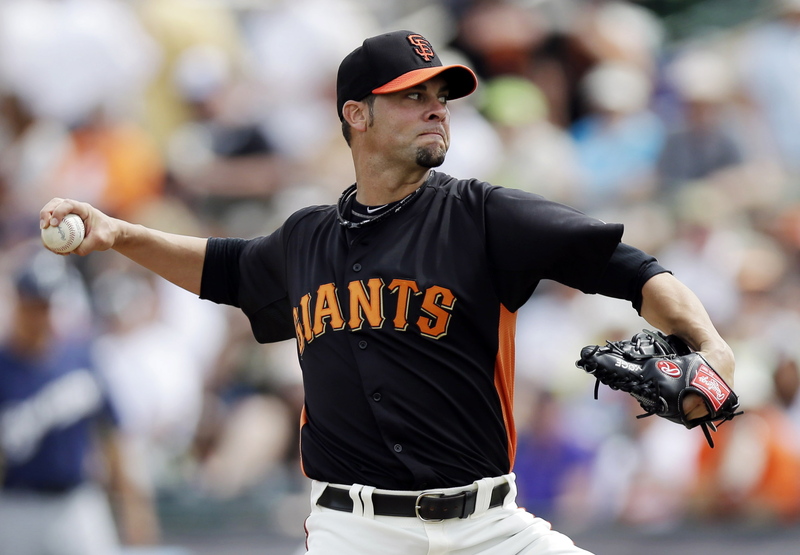 Ryan Vogelsong out 4-6 weeks with broken finger; what are the options? Last season, the Giants have five pitchers make 30 or more starts. No team has done that in back-to-back seasons in about 30 years. And the Giants won’t be doing it again. 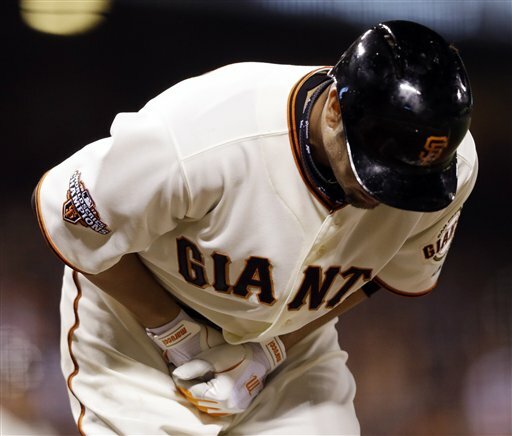 Ryan Vogelsong, in the midst of easily his best start of the season, broke two bones in the pinkie of his pitching hand when he was hit by a pitch while swinging at the ball. Vogelsong will have surgery on his hand Tuesday and is expected to be out four to six weeks. That would put his return date in early July. Vogelsong pitched five shutout innings against the Nationals, giving up three hits with two strikeouts. After Vogelsong’s last start in Toronto, there was talk about taking him out of the rotation. 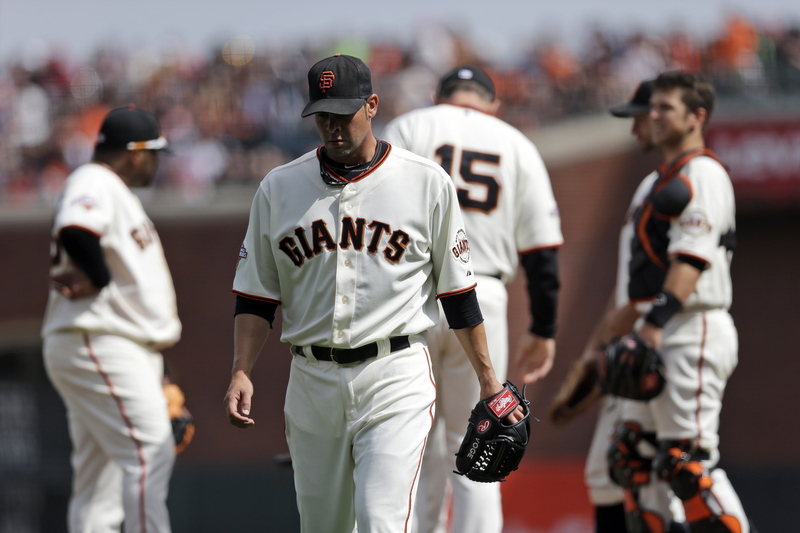 After five innings Monday, it appeared that Vogelsong had put to rest that discussion. Now, the Giants must consider options. Here are a couple. CHAD GAUDIN: Gaudin was signed last offseason to work as a long man out of the bullpen — something the Giants have gone without frequently in recent seasons — and a spot starter. Gaudin has been very good out of the pen, posting a 2.10 ERA in 25.2 innings. Gaudin has made 75 starts over his 11-year career, but none since 2009 with the Yankees. He also had a 72-pitch relief appearance in Vogelsong’s previous start in Toronto. Manager Bruce Bochy said Gaudin is a candidate, but added that he likes his value as a long reliever. YUSMEIRO PETIT: Petit was considered a candidate for the rotation when Barry Zito struggled in spring training last season. And he was one of only two pitchers not named Cain, Bumgarner, Lincecum, Zito or Vogelsong to start a game for the Giants last season. But he is 2-3 with 6.69 ERA at Triple-A Fresno and has allowed nine home runs. But but he also has 46 strikeouts against just nine walks. SHANE LOUX: Loux has been Fresno’s most consistent starter at 4-1 with a 3.68 ERA. But his stuff doesn’t really translate into big-league stuff. He made a brief stint with the Giants last season, posting a 4.97 ERA in 25.1 innings. CHRIS HESTON: The Giants had hoped Heston, the 2012 Eastern League pitcher of the year, would be the next arm produced in the system. But his transition to Triple-A has been bumpy. He’s 5-2 with 5.33 ERA. He gave up three runs in 5.0 to 6.2 innings in six of his nine starts. He got tagged for 5 runs in 5 innings in one other start, and seven innings in 3 innings in another. But he had his best start in his most recent start, giving up 0 runs on 3 hits in 7 innings. 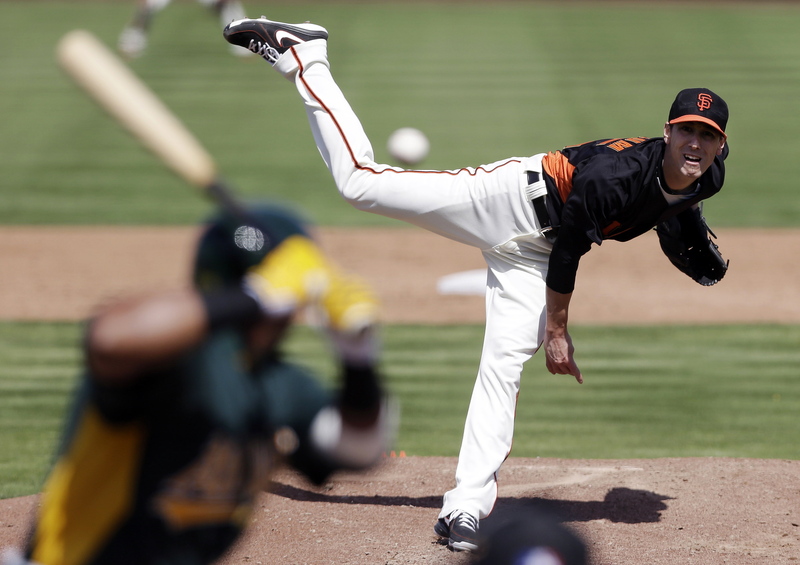 MIKE KICKHAM: The lefty had a rough spring, then got off to a slow start at Fresno. He’s 2-4 with a 4.72 ERA. But in his last four starts, he’s 2-1 with 1.80 ERA with 25 strikeouts against six walks. WHAT MORESPLASHHITS THINKS: The Giants should start with Gaudin. Yeah, he’s been good out of the pen, but the Giants have a lot of good relievers down in Fresno: Dan Runzler, Steve Edlefsen, Ramon Ramirez, Sandy Rosario or Jake Dunning. They could even call up Loux to work as the new long man. And please, Bochy, use the schedule in your favor. The Giants have four days off in June, including three in an eight-day stretch (June 3-10). Even if Bochy doesn’t take advantage of Thursday’s day off — which would only gain them a couple of days — Gaudin could start on Sunday and May 31, then he wouldn’t be needed again until June 15. 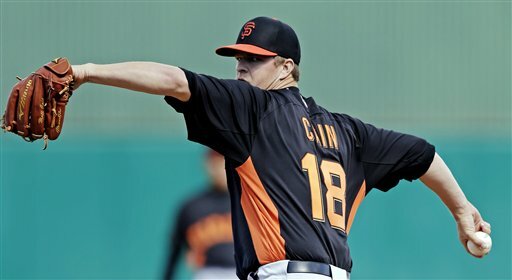 If Vogelsong returns quickly (four weeks), the Giants would only need three starts from Gaudin (or any fifth starter). If Vogey’s hiatus is on the longer side (six weeks), it would be five starts IF they use the days off to skip the No. 5 starter. 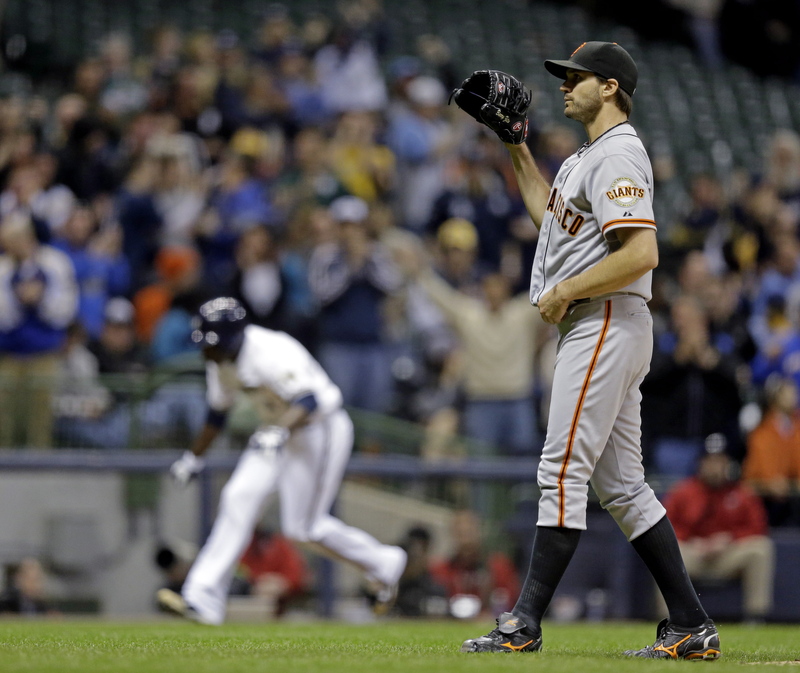 What to do about San Francisco Giants’ Ryan Vogelsong? Sorry, I haven’t blogged in a couple of days. Those two games in Toronto did not inspire me. But the Giants left Canada with one burning question: What to do about Ryan Vogelsong? I’ll admit that even as Vogey has struggled this season, I keep expecting that his next start will be the one in which he finds his groove again. But then it just keeps getting worse. Since his April 22 start against the Diamondbacks, when his ERA sat at 5.68, it has steadily climbed over his last four starts to 6.23, 7.20, 7.78 and now 8.06. And, heck, that doesn’t even include the five UNEARNED runs he allowed on Wednesday. Manager Bruce Bochy said the two errors that contributed to a five-run first inning for the Blue Jays were the worst things that could have happened to Vogelsong, putting a struggling pitcher in a bad situation early. Vogelsong wasn’t looking for excuses, saying that things aren’t always “sunshine and roses” and you have to be able to pitch through trouble. Still Vogelsong continues to insist that he feels like he’s really close to where he needs to be. True, but between the broken bats and dropped outs, there were a lot of VERY hard hit balls, even many of the six outs recorded were on hard-hit balls. Bochy would not say if Vogelsong will make his next start, which is set to come Monday at home against the Nationals, going with the same “we’ve got options and we’ll explore them” line he used after Vogey’s previous start. Is it bad form to mention the last time Vogelsong faced the Nationals at AT&T Park he got lit up for eight runs on nine hits on 2.2 innings? Prior to Wednesday’s start, that Aug. 13 start vs. the Nats last year was Vogelsong’s shortest in a Giants uniform. If we had to guess, we’d say the Giants will give Vogelsong at least one more turn in the rotation to figure things out. A four-game series in Colorado often requires heavy use of the bullpen. 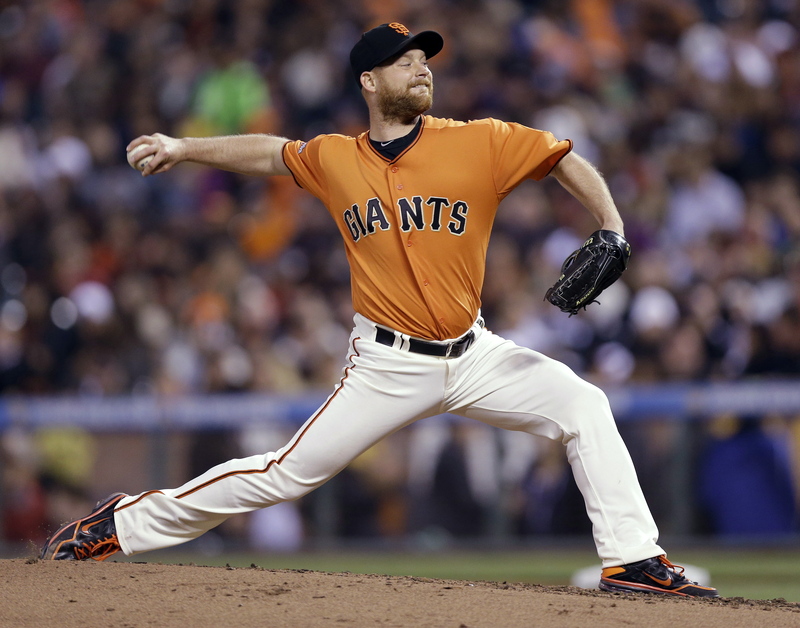 And if the Giants skip Vogey on Monday, that likely means Chad Gaudin would be the likely fill-in starter. And if that’s the case, Gaudin doesn’t pitch this weekend in Colorado, and I doubt the Giants want Vogey coming out of the pen in Coors. So who knows? Last year’s debacle against the Nationals started a seven-start stretch in which Vogey posted on ERA above 10. Maybe this year’s start vs. the Nats will be the one that gets him off this eight-start stretch with an ERA above eight. Right now, it’s all we can hope for. Ryan Vogelsong’s ERA started at 8.44 after giving up five runs in 5.1 against the Cardinals in his first start of the year. Then Vogelsong started dropping his ERA over the next three starts to 7.15, 5.89 and 5.68. You would have expected that trend to continue this early in the season. And yet, Vogey’s ERA has gone the other direction over his last three starts: 6.23 after 5 ER in 5 IP vs. the Padres, 7.20 after 7 ER in 4.2 IP vs. the Dodgers and 7.78 after 6 ER in 4.1 IP vs. the Braves on Thursday. To his credit, Vogelsong says he expects to make his next start Wednesday in Toronto. “Why wouldn’t I?” he said. He says his health and stamina are fine, and he feels “he’s close” to being where he needs to be. And, of course, he’s overcome his share of adversity in his career. When Vogelsong mentioned August of 2011, my first reaction was “He was bad in August 2011? I don’t remember that.” And there was good reason for that: He wasn’t that bad. After his first start in August of 2011, Vogelsong was 9-1 with 2.19 ERA. He then lost six of his next seven starts, but his ERA rose to just 2.66. He had one start in which he gave up five runs in five innings, but did not allow any more than three runs in any of those other starts. So the issue wasn’t Vogey; it was the Giants offense. But August-September of 2012 was something completely different. In a seven-start stretch, he went 2-4 with a huge 10.31 ERA. Vogelsong responded by giving up just one earned run in his final three starts (17 innings) of the regular season. Then in the postseason, he was 3-0 with a 1.09 ERA in four starts. The Giants didn’t skip Vogey during that ugly stretch, and the Giants were in the middle of a pennant chase. 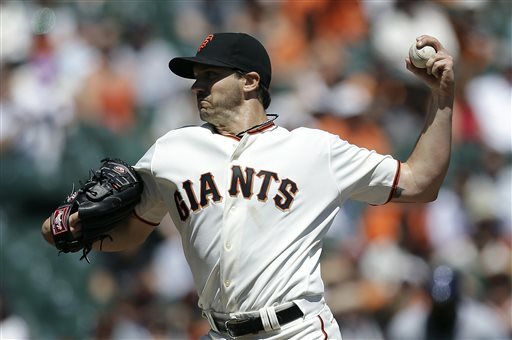 But manager Bruce Bochy said the Giants were considering all options when it come to Vogelsong. That fifth inning has been ugly, no doubt. Hitters are batting .500 in the fifth. While home runs allowed have been balanced, opponents have six doubles and triples in the fifth to only two in innings 1-4. Opponents hit Vogelsong better each time they face him: .271 first time through the lineup, .333 second time, .367 third time. And strikeouts have gone down: 20 first time, 11 second time, 6 third time. There is one caveat to these numbers. Of the 12 fifth-inning runs allowed in the fifth inning, 10 have come in his last two starts (6 vs. Dodgers, 4 vs. Braves). Also four of those runs were scored after Vogelsong left the game because the reliever could not keep the inherited runners from scoring. BACK OFF BETWEEN STARTS: Vogelsong is a hard worker, a by-product of his path back to big leagues. He takes nothing for granted, and that’s why we love him. But that attitude could have a flip side. “If anything, he might work too hard at times,” Bochy said. So the Giants might monitor his throwing sessions between starts. SKIP HIS NEXT START: The Giants have a off day on Monday, so they could skip Vogelsong’s turn in the rotation to give him time to work on things in the bullpen. But that would only move his next start from Wednesday in Toronto to Saturday (May 18) in Colorado. But how much good would three extra days rest do? Also, do you want to skip a start in Toronto to make one in Colorado? If he pitches on his normal turn, he would miss the four-game series at Coors. SEND HIM TO THE PEN, FIND A REPLACEMENT: Vogelsong’s struggle set off calls to find someone in the minors to replace him. Well, this has been weakness of the Giants since spring training, and it hasn’t gotten much better. At Fresno, the starters include Chris Heston (3-2, 5.82 ERA), Mike Kickham (0-4, 5.65), Yusmeiro Petit (2-3, 6.69) and Boof Bonser (1-2, 5.45). The best option might be Shane Loux (3-1, 4.21), if that idea excites you. The numbers are better at Double-A where you have Justin Fitzgerald (3-0, 1.09) and Jack Snodgrass (3-0, 2.60). But the AA Atlantic League is a pitcher-friendly league, while the PCL is hitter-friendly. We’ve seen what making the jump from AA to AAA has done to the likes of Heston and Kickham. Making the jump all the way to bigs is a larger leap. Plus moving Vogelsong to the pen thins out an already overtaxed bullpen. Using long reliever Chad Gaudin as a spot starter is iffy. He’s only made one appearance of 3 innings, so stretching him out is no given. Plus, again, it thins out the pen. KEEP HIM IN THE ROTATION AND LET HIM WORK IT OUT: These appears to be the most likely option, at least for now. While Bochy did talk about “options” he also said: “I do think the pitches caught up with him in the fifth,” Bochy said. “He worked pretty hard and he was up to 90 pitches in 4 1/3 innings. Up to that point, he was pretty good.” So while the Giants would love to get 6 or 7 solid innings from Vogey in Toronto, where the DH allows pitcher to go deeper into games, he may be on a very short leash, with Gaudin ready to pick up the innings on the back side. 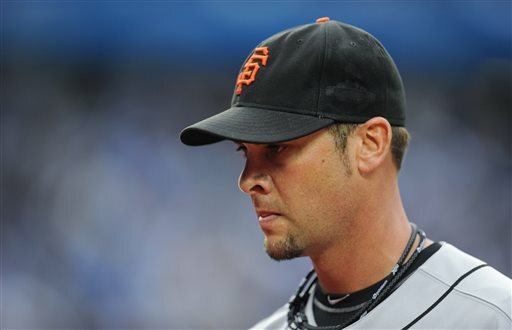 Sabermetricians will say Ryan Vogelsong had a bad outing Saturday against the St. Louis Cardinals. And when you look at the final statistics, it would be hard to argue. 5.1 innings, 9 hits, 5 earned runs, two walks and six strikeouts. But if you actually sat and watched the game, you’d say Vogelsong pitched well and had a good game … well, almost. For the first four innings, the Cardinals were not making much solid contact against Vogelsong. Yet, St. Louis had a run on the board. Vogelsong gave up the first earned run by a Giants starter this season in the first inning. The rally was fueled by two hits — Matt Carpenter’s swining bunt and Carlos Beltran’s two-out looper to right. After Beltran’s single, Vogelsong would set down 10 of the next 11 hitters he faced. Then came the most unfortunate fifth inning. It started with Pete Kozma’s grounder into the hole at short that Brandon Crawford was able to glove. But Brandon Belt was unable to handle Crawford’s short-hopped throw to first, and Kozma was safe on an infield single. After Kozma advanced to second, then third on a pair of outs — and then Carpenter walked — Vogelsong was in position to get out of the jam when he threw an 0-1 curverball to Matt Holliday. Holliday got out in front of the pitch, but was able to put the bat on the ball and hit a perfect seeing-eye grounder into left field to tie the game at 2-2. Vogelsong may have escaped the damage right there when Allen Craig hit a sharp grounder between third and short. Pablo Sandoval made a diving smother of the ball, but could not come up with the ball cleanly to record an out. What made the play even more unfortunate for Vogey and the Giants is that if Sandoval had let the ball go past him, Crawford was in position to field the ball cleanly and throw out Craig. Instead, the bases were loaded. Then Beltran followed with a clean, two-run single to right to make it 4-2. The bad luck didn’t end there for the Giants. Trailing 5-2 in the bottom of the sixth, it looked like they were ready to mount a rally when Hunter Pence and Brandon Belt drew one-out walks. Joaquin Arias was called on to hit for Gregor Blanco. Arias then hit a liner to the right side of the infield that first baseman Craig was able to snare and turn into a inning-ending double play. And he didn’t. But that’s baseball sometimes. The end result was a loss that snapped the Giants’ three-game winning streak. It also snapped a seven-game winning streak of meaningful games for the Giants at AT&T Park that dated back to Game 1 of the National League Championship Series. POWER FROM PENCE AND PANDA: Last season, the Giants hit the fewest home runs in the majors. This season, so far, they have hit four home runs, tying them for 16th in the majors. All four have come off the bats of Pence and Sandoval. The duo hit homers in Wednesday’s win over the Dodgers, and both connected again on Saturday. Pence is hitting .294 so far, and Sandoval is hitting .274. Plus, the Panda said he still feels a little lost at the plate after missing time late in spring training with a sore elbow. WHO IS THIS GUY IMPERSONATING MARCO SCUTARO? Marco Scutaro went 1 for 4 Saturday, raising his average to .105. At least we think it’s Marco Scutaro. It looks like Scutaro. But the Scutaro we know struck out swinging only five times in 2012 after joining the Giants. He’s already struck out swinging twice in five games this season, including with the bases loaded and one out on Friday. On Saturday, he did something else strange. Last year, Scutaro swung at the first pitch on 13 percent of the time while playing for the Giants. In the bottom of the ninth with two outs, a runner on first and trailing by three runs, Scutaro swung at the first pitch and flied to right to end the game. Who IS this guy? GOOD THINGS FOR BRANDON BELT? It’s been a rough week for Brandon Belt. First he looks bad against Clayton Kershaw in the season opener in LA. Then he gets food poisoning, which sidelined him for two games and caused him to loose 11 pounds. After an 0-for-4 day on Friday, Belt went 0-for-3 with walk on Saturday, leaving him 0 for 10 on the season. But two of hits outs on Saturday were loud outs, a liner to center in the second and a rope to first in the fourth. After fanning twice against Kershaw on Monday, Belt hasn’t fanned in his two games this weekend. Good things could be on the way for Belt. Fresh off two solid starts in the World Baseball Classic, Ryan Vogelsong was back on the mound Wednesday for the San Francisco Giants. And he appeared in midseason form. Vogelsong threw six shutout innings, giving up just three hits and striking out seven in what would eventually be a 0-0 10-inning tie with the Milwaukee Brewers. Vogelsong threw 60 of his 82 pitches for strikes. Vogelsong said he even had chicken enchiladas on Tuesday night, just like he does during the regular season. 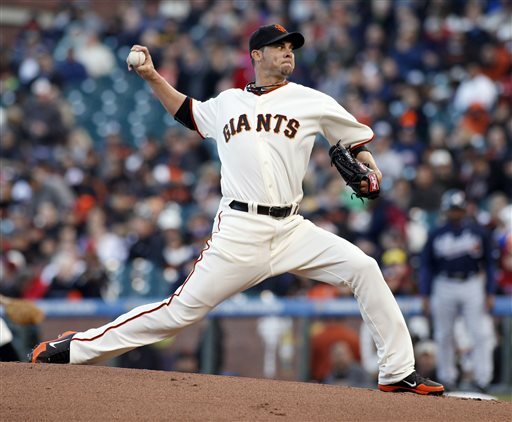 Vogelsong’s outing was just the latest in a span of solid outings for Giants’ starting pitchers. Just look at the last time through the rotation this spring. And now the rotation appears set through the rest of the spring, with all five starters getting two more spring starts before the opener on April 1. Are you getting fired up yet?